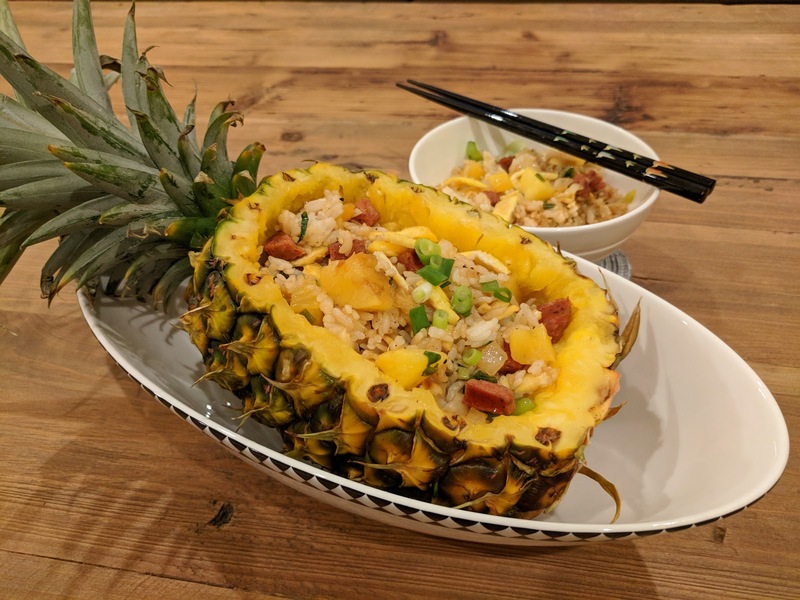 I've always wanted to make pineapple fried rice and serve it in a pineapple boat! Now that I'm spending more time in Maui, where pineapples are inexpensive, abundant and sweet(! ), I've finally done it. We used to make Saturday morning trips as a family from Toronto to the St Jacob's farmers market near Kitchener/Waterloo and my dad would buy a pineapple to make pineapple fried rice for dinner that evening. As a kid, the presentation of it was so fun and cool to see! Now I realize the process of removing the pineapple while keeping it mostly intact, takes some (read A LOT OF!) patience and work. First, prepare the pineapple and cut the meat out. Cut the pineapple vertically at about the half (make sure you keep the full crown intact). Cut around the perimeter of the pineapple, across to make slices and scoop the meat out. Cut into chunks and set aside. Be sure to discard the pineapple core- you don't want that to go into your rice! Next, pour 1/2 tbsp oil in a cast iron pan over medium heat. Mix the eggs in a bowl, add 1/2 a tsp salt and fry the egg in the pan for a few minutes on each side, about 5 min total. Once it's cooked, remove from the pan and cut the egg up into small pieces. Set aside. Over medium heat, pour 1/2 tbsp oil into the pan and cook the red onions for 4-5 min until they've browned slightly and are translucent. Add the pineapple, BBQ pork or Chinese sausage (whichever one you're using) and cook for 3 min. Add the sushi rice OR jasmine rice + water, breaking the rice apart with the spatula. I leave the rice out ahead of time to bring it to room temperature so that the clumps of rice break apart and heat up more easily. Add the soy sauce and oyster sauce and stir everything together. Pour a little more water in the pan if you need to use it to break apart the rice. Once the rice is warmed up and mixed in with the ingredients, add the green onions, sugar, pepper and remaining salt. 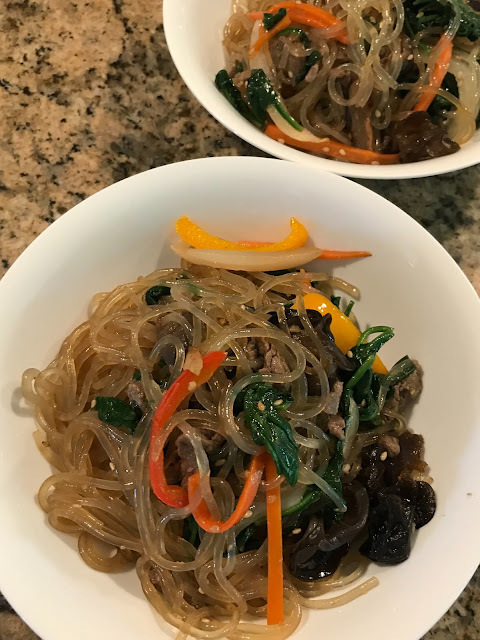 Have a taste to see if you'd like to add more soy sauce or pepper for taste. Scoop the rice into your pineapple boat and serve. The rice won't all fit into the pineapple and that is OK - scoop the rest into a serving bowl or individual bowls for your guests. This rice looks SO GOOD!!!! 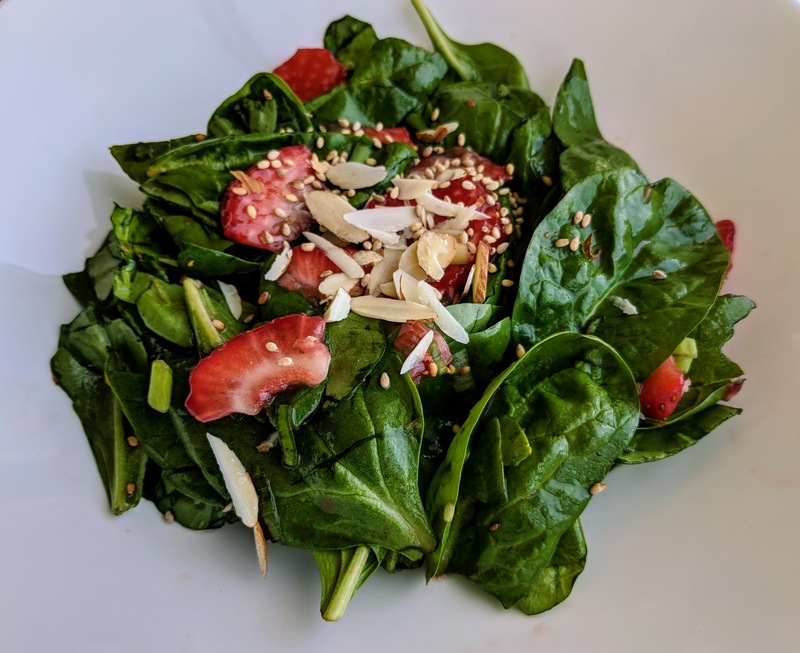 Thanks for checking my recipe out and the complement! hope you enjoy it!